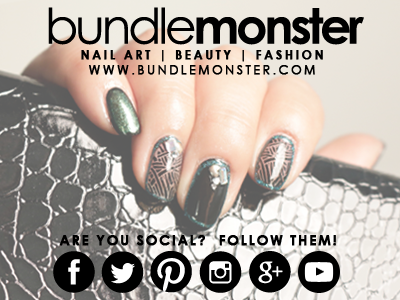 It is October...so let the haunting and spooky nails begin. Halloween nails are my favorite! I received this Baroque Floral Stamping Plate from Born Pretty Store in exchange for an honest review. The plate consists of six full nail designs and five single images. The full nail designs are square, which can be difficult if you have long nails. But if you stamp the design at an angle, then you can cover the whole nail. I like that some of the designs have a lot of "background" stamping...so the part that you stamp becomes the background of the design. 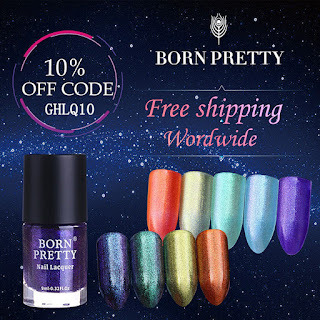 For this or other nail art supplies, use coupon code GHLQ10 for 10% off. Apply a red base color. Use a wet makeup sponge to create a gradient with red and dark red polish. The dark red polish should be at the base of the nail. Use black stamping polish to stamp a baroque floral design on each nail. Glue gold crescent charms to the base of the index and middle fingers.